What is set_multi_cpu_usage in physical design or STA? Do you want to find your answers too? 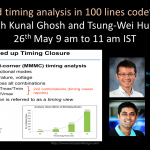 Enroll in the upcoming webinar on “Distributed timing analysis” with Tsung-Wei, do labs on your own, understand the framework and I can guarantee you would be a better STA engineer or Lead than you were before 26th May.